Initially, although the merry riot of birds kept me occupied, I started feeling a sense of solitude settle upon me – mostly because it was hard for them to adjust to an intruder. As time progressed, I started to observe some peculiar behaviour amongst birds – behaviour largely influenced by my presence, but also oblivious to it. The impact my presence had – or did not have – largely depends upon how you, a human observer, perceive me: as a part of the landscape or removed from it. Being a part of this natural world, albeit being a human, I found the disturbance of the birds in my presence justified when I observed the disturbance caused when other birds like starlings and the treepies arrived. Although I could not fly, I started to feel that I was a part of the landscape. And under the shade of this Palash tree, I found solace. It stands just beyond a small perennial pond, near the bank of a dried-up stream that arises from this pond and joins Jamunia several hundred yards further. The tree stands about four meters from ground, is a little bent at the base, and branches into two before it rises straight up. It bears scars of hacking near its base which appear to have healed, and up high on its crown rests a magnificent coronation of flowers like little oil lamps setting the forest ablaze. The tree is probably a decade or two old. I noticed it first last summer, when it scarcely blossomed and soon shed leaves. It now stands magnificent amongst trees that are either shedding leaves or sprouting new ones. It is the only tree that would catch your attention if you stood by the pond. Three other Palash stand close by, one to the left and two behind the tree, all in their early stage of flowering. 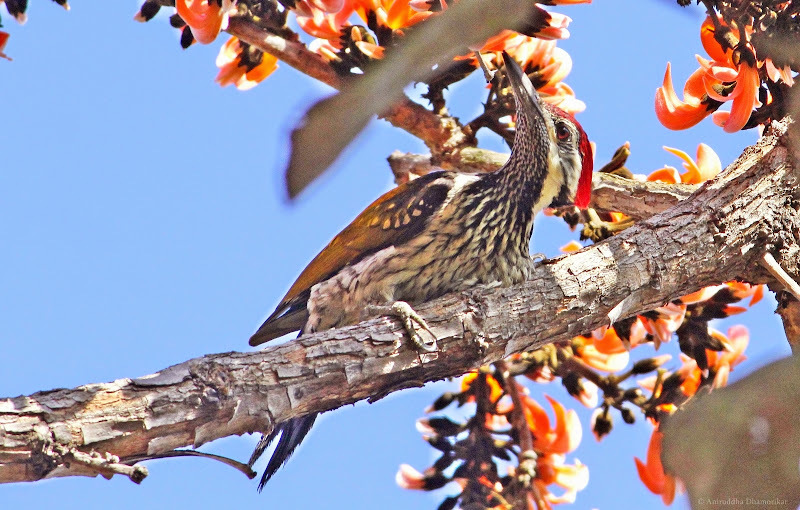 Birds of an array of colours visit this one – from the tiny warblers and sunbirds, to treepies and woodpeckers – to relish its vast reserves of nectar. At any point of the day, between sunrise and sundown, at least a few birds would be occupying the tree. Most lively of the lot are the Purple Sunbirds. Their chatter is a constant company, and you will see them chase one another with fervor between their feeding breaks. Oriental White-eyes are rather noisy ones, chasing each without any particular reason, chuckling to themselves in what sounds like clicks. Both these species are content with chasing their own counterparts, and the interspecific competition seems to be absent – probably because there are just so many flowers to drink from. 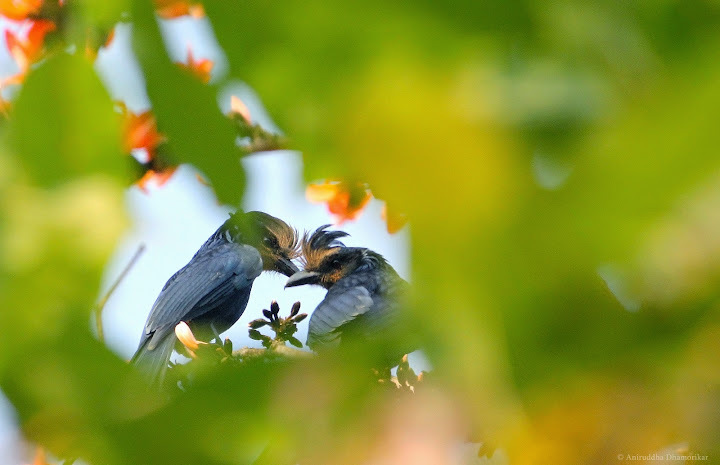 It is only when a band of Chestnut-tailed Starlings appeared that they disappeared to find shelter on nearby trees with thick foliage, or visited the newly flowering Palash trees. Although I did not see starlings intentionally bothering the little birds, their presence in large numbers seemed to deter them. A little flock of starlings, about three or four in numbers, is tolerated by most birds. I once saw them feeding peacefully in the company of Common Myna, Golden-fronted Leafbird (Chloropsis), Purple Sunbird, Oriental White-eye, and Black Drongo. But I’ve also seen them in tens, reigning over the tree in absence of others. The Leafbirds were rather random in how they approach this tree, perhaps because they know several others in the vicinity, or it could be because of the fact that they are shy. But I saw them feeding contently – both males and females – while I was calmly sitting under the tree. When I approached the tree, careful though I was, I sometimes flushed the birds out. But as I settled, I noticed a trend. 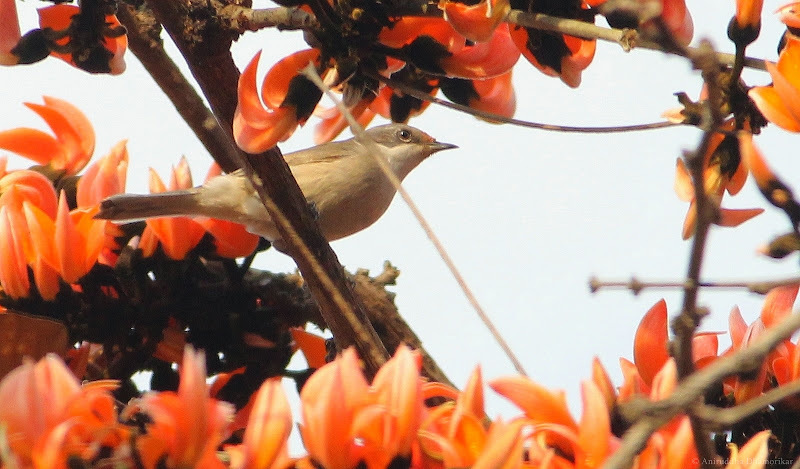 The earliest birds to return were the sunbirds, closely followed by white-eyes, warblers and tailorbirds, and later large birds like leafbirds, starlings, and mynas also appeared. The vagrant visitors, and most shy of the lot, are the larger birds like Black-rumped Flameback, Rufus-bellied Treepie, Greater Racket-tailed Drongo, and Rose-ringed and Plum-headed Parakeets – all extremely wary of my presence. Only on a few occasions, when I hid under the lush canopy of an adjoining Jamun (Syzygium cumini) tree, could I observe them contently from the crack in the canopy. 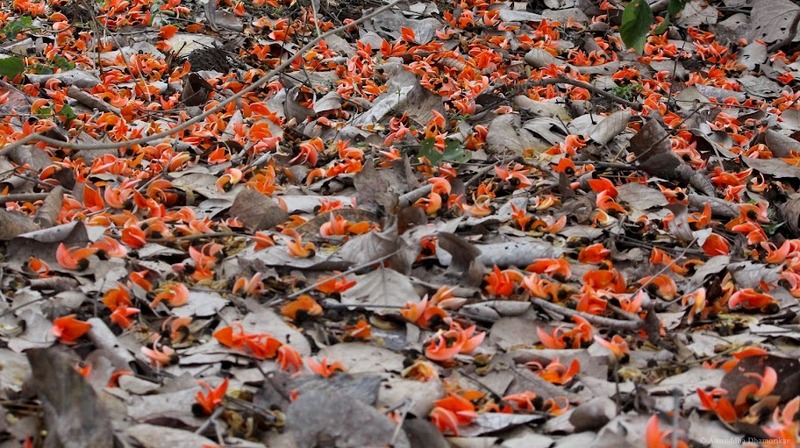 but they were also seen intently plucking flowers and dropping them to the ground. What’s curious is that all these birds vary in their habits, and their beaks are of a variety of shapes, adapted to what they feed on. On Palash, they all converge; broad-billed, short-billed, and needle-billed alike; feeding on the nectar with sheer delight. 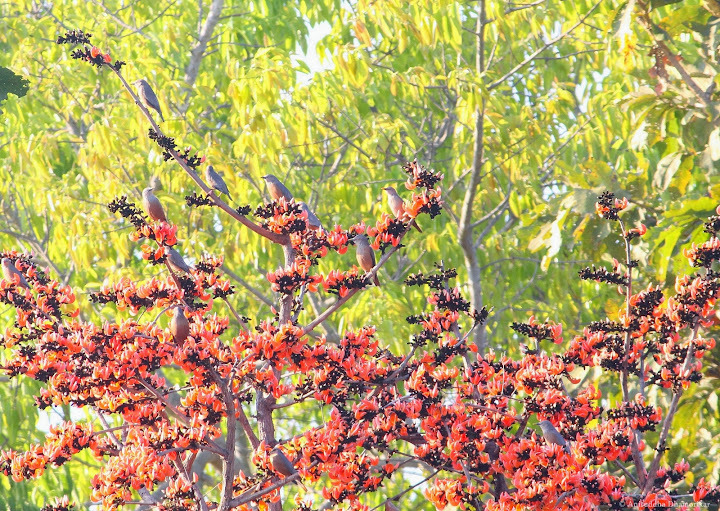 The Palash tree has evolved itself to make the best out of this: to get itself pollinated. Oriental White-eye, seen with a bindi on its forehead - probably a mark left behind by Palash's pollen. The exposed filament and stigma can be seen just below the beak of the bird. 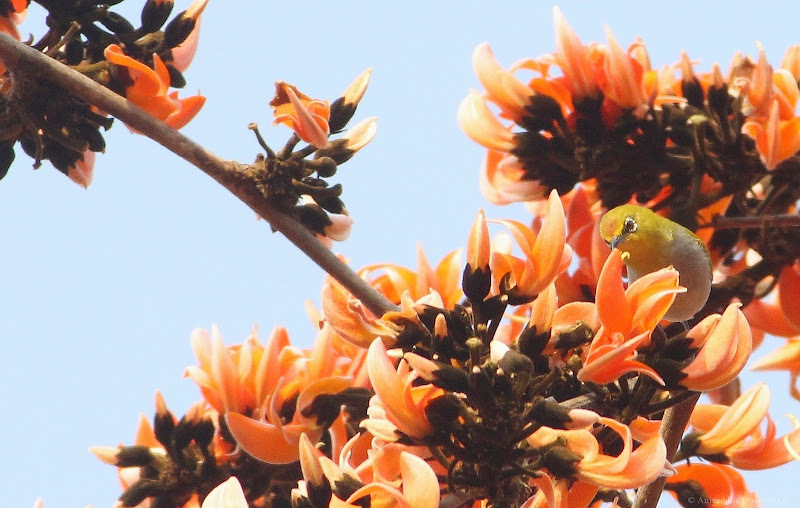 Most birds that have been feeding on Palash’s nectar carry a bindi on their foreheads – a saffron mark left there by the anthers of Palash’s strategically designed flowers. 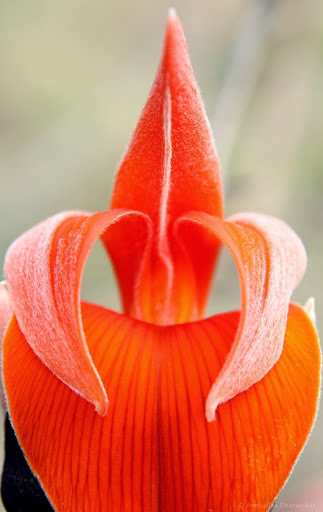 which protrude out when pressure is applied to the inner base of the flower. 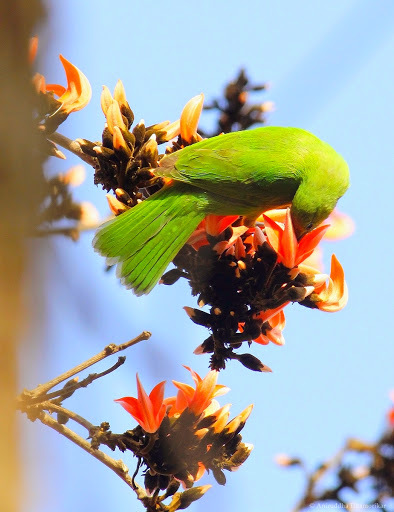 Appearing like a set of jaws, the flowers of Palash open outward from the branches, and their inflorescence creates a bed on which birds can land and feed. 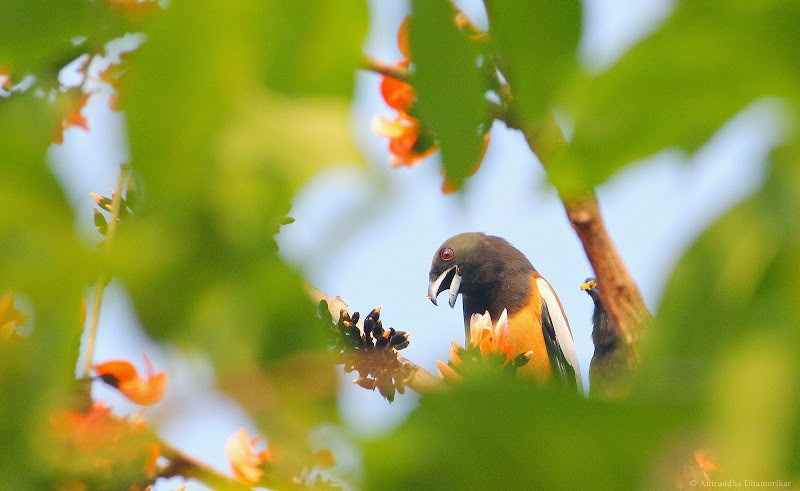 The birds require to reach inside the mouth of the flower for the nectar in a peculiar way, and while doing so, their crown (or throat – whichever way the flower or bird is oriented), rubs against the folded petal that enclose filaments carrying anthers and a style carrying stigma. As the birds try to reach further in for nectar, the filaments get exposed, and rub against the bird, transporting pollen with a hope that they will be cross-fertilized when the bird visits another tree to feed upon. Some birds, though, also feed from the side, or the flower grows in an awkward shape to reach in properly, completely skipping the intricate mechanism set in place by the tree. Most birds would try to reach in for nectar in any way possible. 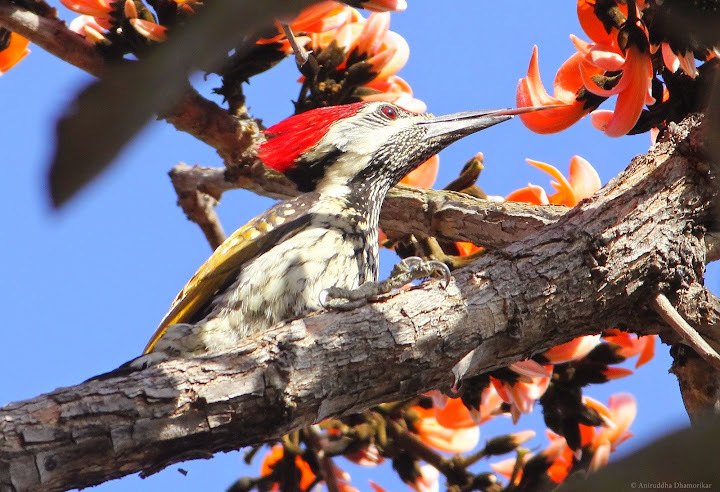 I saw a Black-rumped Flameback woodpecker feed on the nectar using its long tongue from far. 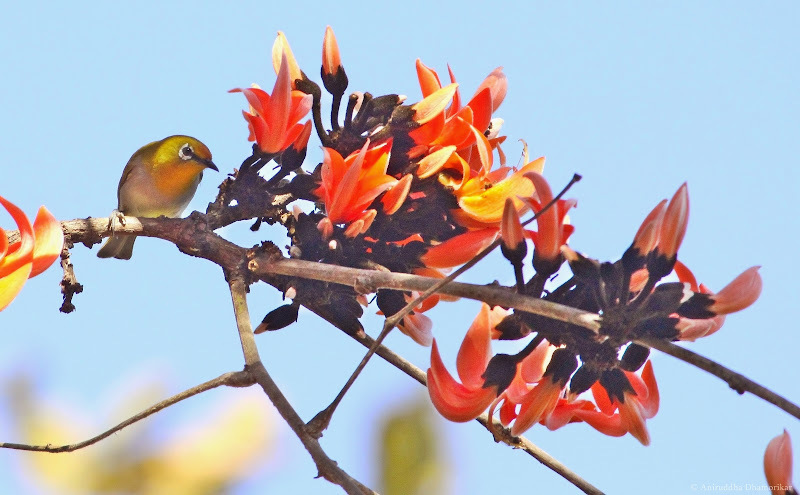 Almost all the birds like the Tailorbird, Purple Sunbird, Oriental White-eye, Black Drongo, Golden-fronted Leafbird, Chestnut-tailed Starling, and Common Myna, feed as per the mechanism set in place by the tree (if the flower is properly placed) owing to their small sizes or shorter beaks. 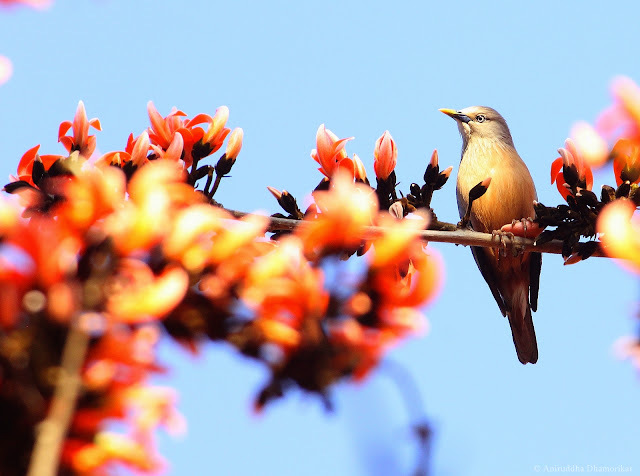 I once saw a pair of Greater Racket-tailed Drongos with a rather exotic colour on their faces – only to realise that it was the pollen they were smeared with (which likely belonged to a neighbouring Semal (Bombax ceiba) tree that is also currently in full bloom). The reason why so many birds converge on this tree was quite interesting and boldly apparent: its colour. 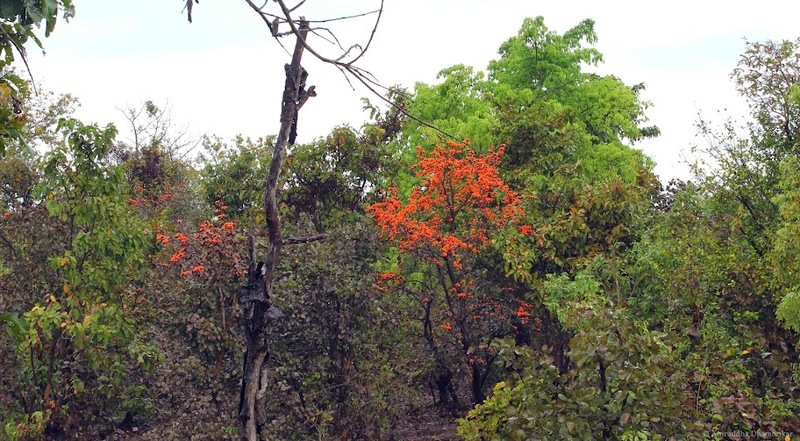 Trees in summer (like Palash, Semal or Red Silk Cotton Tree, and Indian Coral Tree (Erythrina spp.)) often blossom in bright shades of reds to attract birds. Birds are sensitive to light around 570 nm in wavelength (i.e. light between green and red) thanks to the presence of the cone pigment “iodopsin” (Varela et al., quoted in Wikipedia). 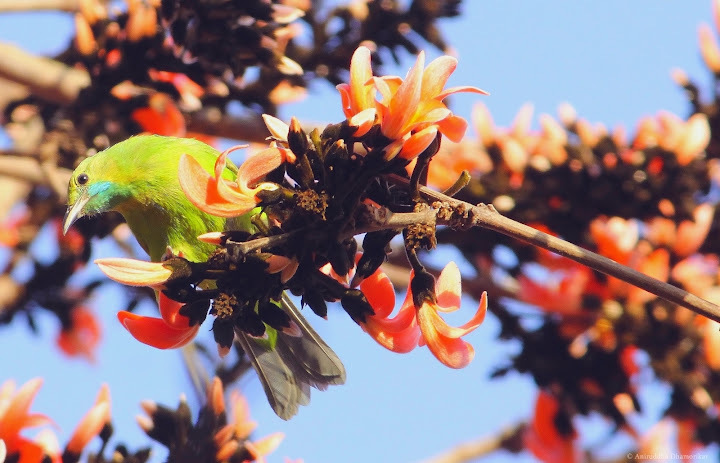 And almost all trees relying on birds for pollination are known to have brightly coloured flowers in this same visible wavelength, exploiting a bird’s excellent sense of vision. This colour is what makes Palash’s profusion stand out in the landscape, attracting birds from far, and ensuring the passing of its progeny. Plants that flower in shades of purple and violet (around 300 nm according to Markha et al, 2004 and Backhaus et al, 1998, quoted in Wikipedia), do so to attract another efficient pollinator: insects. Although insects visit a variety of flowers irrespective of their shape, colour, and scent, purple and violet colours are much more common in plants during monsoon, probably to attract insects which are higher in diversity and density during this season. Read more about this hypothesis in On a few Wonders of Sahyadri. As I sat under this Palash tree, I began to wonder about these intricate relationships plants have with animals. Both are subconsciously providing crucial services to one another, maintaining the balance in an ecosystem. What if this mechanism was adopted for afforestation and habitat restoration? 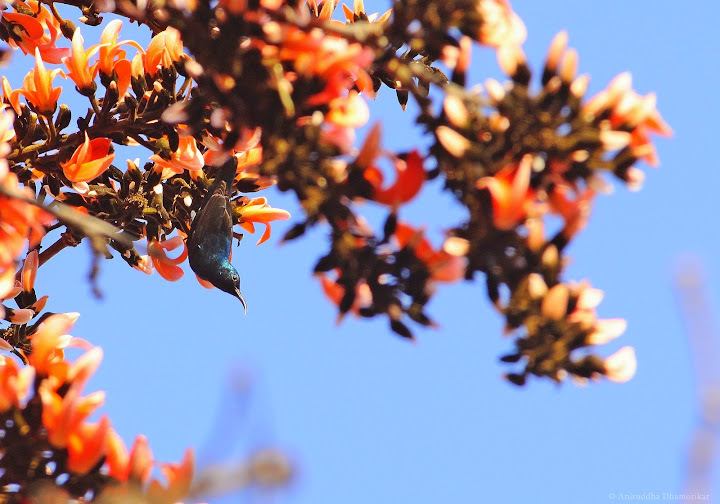 Although several scientific methods are being applied for such initiatives, exploiting the visual aspects of trees and pollinators is crucial to invite the diversity of life into a degraded ecosystem. In case of Palash which is found across India, it can be vital in long-term conservation of afforestation projects, because they invite a diversity of other animals to the area. Similarly, trees like Red Silk Cotton Tree and Indian Coral Tree can be used in such programmes as well. My theory is based on this premise: When I sat under the tree, I represented the disturbance (in the presence or absence of the tree) because of which no birds would arrive. Then, they noticed I had settled down – or probably left – and in my place stood a Palash tree in its full blossom. 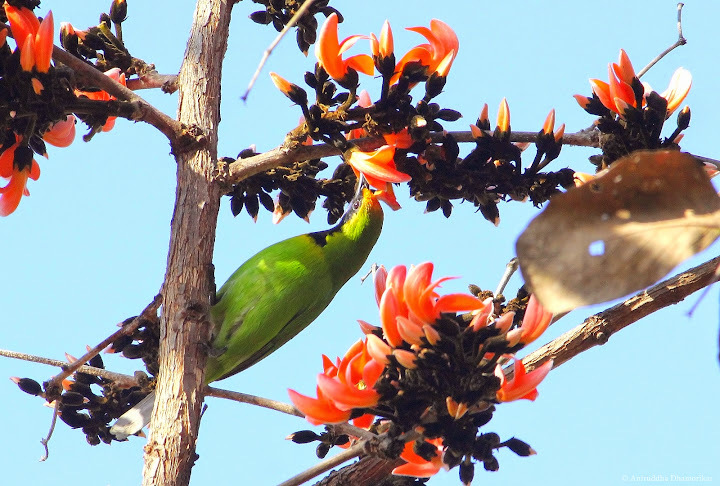 Soon, the most tolerant of the lot, the sunbirds, white-eyes, tailorbirds and warblers arrived – followed closely by leafbirds, starlings, and mynas – and later by other larger birds like parakeets and mammals like squirrels. This completed the picture – the birds fed, the tree pollinated, and a balance between the two was set in place. Unfortunately, most plant nurseries do not breed these species, and therefore obtaining them is difficult. The logic of plantations of Eucalyptus and Acacia, which is still rather prevalent in Central India even today, is not ecological, yet their saplings are still common in nurseries. Adopting a ‘visual invitation approach’ by using indigenous trees which produce flashy flowers will help in the process of attaining a balance in an ecosystem, if used in combination with other species. It is important to understand relationships between plants and animals, not only for mere research, but because they can help us bring back the forests that we have destroyed, and trees – multitudes of them – to sit under and gaze upon. I still sit under this Palash tree, and will continue to do so whenever I get time, with a hope that by being one with the landscape I’ll find more about this tree’s secret. By doing so, I think that I’m as much as a starling or a treepie, only without wings. All photographs were taken on the single Palash tree I sat under. Excellent read as always !! The weather though harsh this time around the year, the tree is magnificent with its blossom. The seed pods hanging by the bunch also makes for a pretty sight amongst those where the flowers had reduced significantly. Silently waiting for more in this space. Best wishes !! Cheers.